Second, you need to hire someone to do this for you. Even if you know what an excavator is, you still need to hire someone to do this for you, unless you are a licensed and trained operator. Not kidding here. 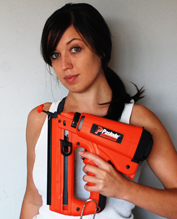 You could accidentally knock your house down very easily with one of these puppies. 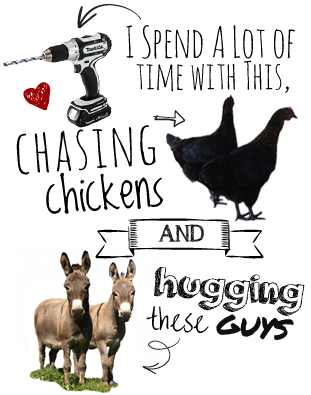 And on that note… happy digging! Just kidding. Let’s start with some foundation basics, shall we? The basic elements of the foundation are shown in this professional, high-quality, dimensionally accurate cross-section, that I definitely did not make in PowerPoint at 2:30 in the morning. 1. 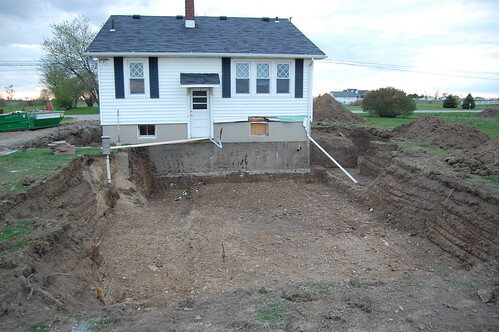 Excavation – someone digs a bigass hole in your yard a couple of feet wider, but in the same general shape as your foundation. 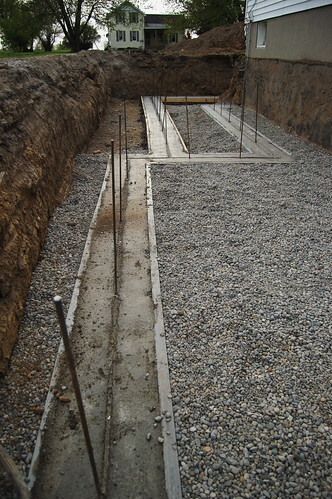 If it’s a basement, the center will be dug out and the hole will be basement depth. If it’s a crawl or slab just the area for the walls will be excavated to a depth below your frost line. 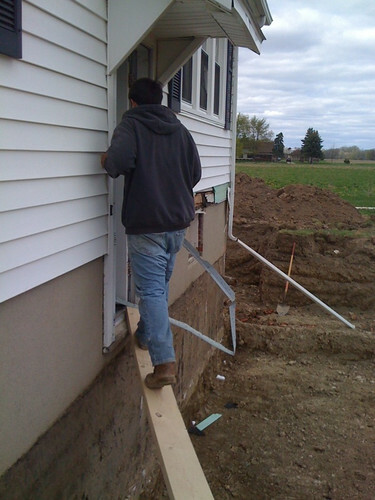 (In Michigan, for example, all foundations must be set to a depth of at least four feet below grade.) The someone who digs this should be professional. If you’re acting as your own general contractor, you need to call a utility marking service (In Michigan it’s Miss Dig) about a week before you excavate, or you could end up running madly through your yard trying to escape certain death from a gas line explosion. They do this for free, just so you don’t kill yourself and your four closest neighbors. 2.) 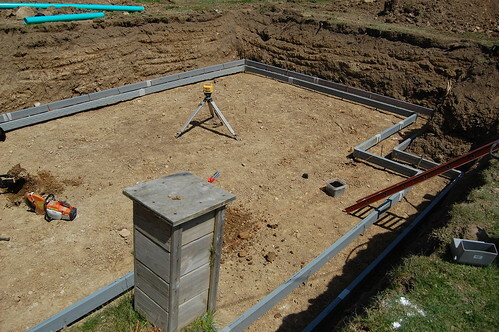 Footers/Pads – Footers are the foundation of your foundation. 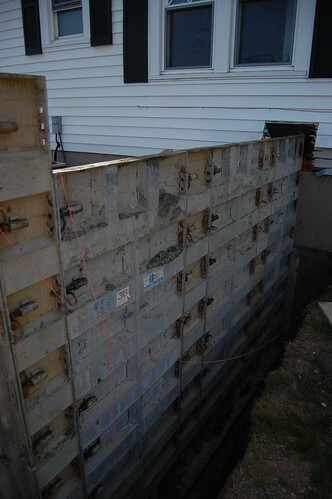 Your basement or crawlspace walls will rest on them, and they will bear the weight of all exterior walls of the house. 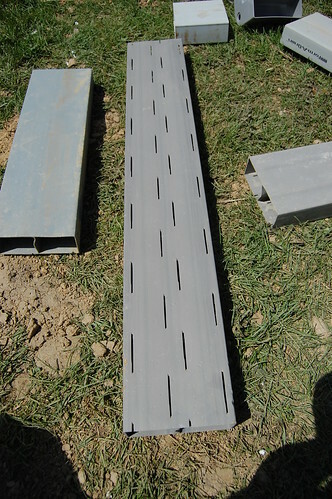 If it’s done right, footers under a basement wall should have drainage tile around them, like form-a-drain, that carry water away from your basement. Crawls don’t need this. 3.) Walls- If they’re block, you’re going to need a mason. If they’re poured walls, you’re going to need a crew with forms, a boom truck, and a little know-how. Again, I’m all for DIYing the hell out of stuff, but this will be significantly less painful and your house will be less likely to collapse in on itself if you hire it out. 4.) 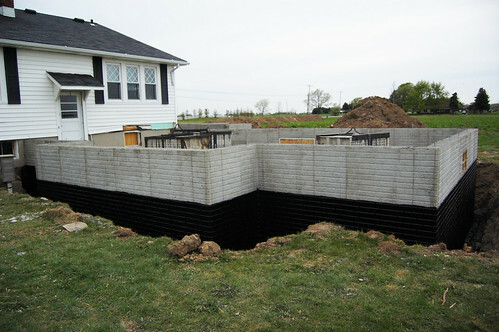 Waterproofing- All parts of the foundation walls below grade should be waterproofed. 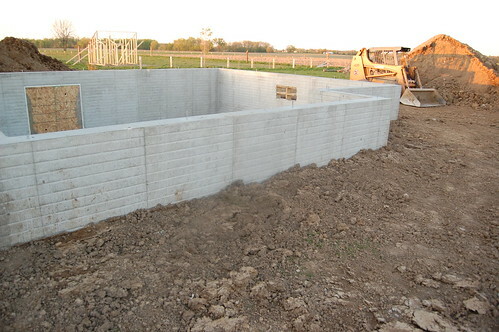 If you’re using a foundation company, this is generally included in the price of the foundation, and they will take care of scheduling the waterproofing. 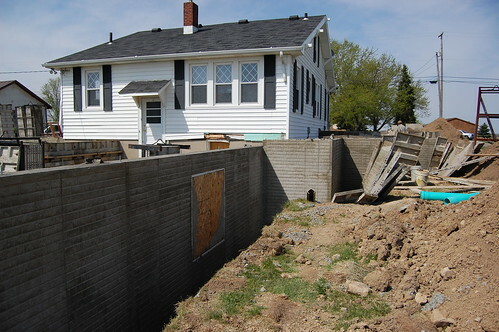 It can generally be done as soon as the walls are stripped, but you want to let it set up for 24 hours before backfilling. Most waterproofing methods employ some sort of asphalt based product, but there are polymers and other options available. Most of them stink, but it’s a short lived problem, since soon they’ll be underground. 5.) 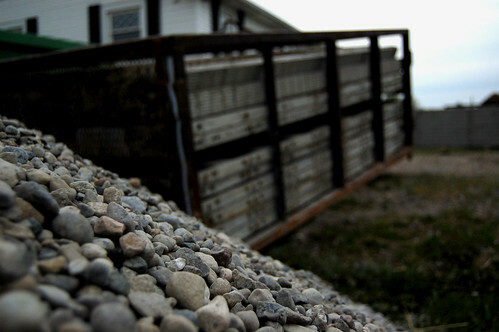 Backfill- This is the step that takes you up to “buildable”. 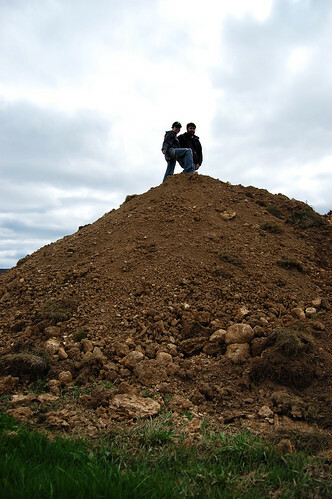 A skidster or other small pieces of equipment with a bucket is used to backfill with stone and topsoil. Yeah. Not OSHA approved, if you were wondering. Up next? Framing that baby! An excavator is a Snort. (A reference to the children’s book Are You My Mother) and isn’t a crawl space where you burry the bodies? This article is too technical for me. But what I got from this article is to hire a reputable contractor to work the excavator if I ever need to have some part of my house excavated. Can you give advice on building a basement home? I’ve never built a basement home, and you’ll probably want someone experienced to give you advice on that. Nice presentation about DIY House Addition! I loved your post . Der Staat ist das Problem und nicht die LÃ¶sung. Wenn der BÃ¼rger Bio essen mÃ¶chte oder Biostrom oder Biosprit bitte – dann soll er aber auch dafÃ¼r zu zahlen.Der Staat hat sich aus derlei Dingen rauszuhalten. Das Problem ist, dass die meisten keine Ahnung von Wirtschaft haben, sonst wÃ¼rden sie sofort erkennen, wer sie ausraubt. Kleiner Tipp: Es sind ganz bestimmt nicht die gierigen Unternehmen und bÃ¶sen Spekulanten. So sorry to hear this Kelly. I wil do an update on the situation in coming days, but it looks very bad for learner drivers out there. The impacts on job prospects and study, without adequate public transport, are dire.Best of luck for next time.